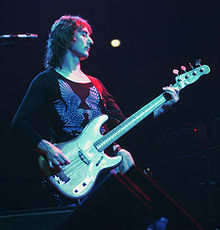 ^ After splitting with McCartney in 1981, Laine was paid an additional £135,000 ($255,000 in 1981) for "Mull of Kintyre". ^ "Milestones, Sep. 26, 1977". Time. 26 September 2007. Retrieved 30 July 2016. ^ Johnstone, Andrew (6 February 2015). "A General Guide to Soft Rock". Rip It Up. Archived from the original on 10 February 2015. Retrieved 30 July 2016. ^ uao (3 July 2005). "Sunday Morning Playlist: Soft Rock". Blogcritics. Archived from the original on 30 July 2016. Retrieved 30 July 2016. ^ a b c d Lewisohn, Mark (2002). Wingspan. Little, Brown and Company (New York). ISBN 0-316-86032-8. ^ a b c d e Miles, Barry; Badman, Keith, eds. (2001). The Beatles Diary After the Break-Up: 1970–2001 (reprint ed.). London: Music Sales Group. ISBN 978-0-7119-8307-6. ^ Perone, James E. (2012). The Album: A Guide to Pop Music's Most Provocative, Influential, and Important Creations. ABC-CLIO. p. 147. ISBN 978-0-313-37907-9. ^ Wright, Jeb. Denny Seiwell of Wings Archived 3 August 2007 at the Wayback Machine. Interview, Classic Rock Revisited website. Retrieved 17 May 2007. ^ Erlewine, Stephen Thomas. "Wild Life – Paul McCartney, Wings : Songs, Reviews, Credits, Awards". AllMusic. Retrieved 18 April 2013. ^ Woffinden, Bob (1981). The Beatles Apart. London: Proteus. pp. 47, 62–63. ISBN 0-906071-89-5. ^ Madinger, Chip; Easter, Mark (2000). Eight Arms to Hold You: The Solo Beatles Compendium. Chesterfield, MO: 44.1 Productions. p. 151. ISBN 0-615-11724-4. ^ a b Carr, Roy, and Tyler, Tony. The Beatles: An Illustrated Record. New York: Harmony Books, a subsidiary of Crown Publishing Group, 1975. ISBN 0-517-52045-1. ^ Doggett, Peter (2011). You Never Give Me Your Money: The Beatles After the Breakup. New York, NY: It Books. pp. 177, 194–95, 208. ISBN 978-0-06-177418-8. ^ Schaffner, Nicholas (1978). The Beatles Forever. New York, NY: McGraw-Hill. p. 156. ISBN 0-07-055087-5. ^ Rodriguez, Robert (2010). Fab Four FAQ 2.0: The Beatles' Solo Years, 1970–1980. Milwaukee, WI: Backbeat Books. pp. 43, 95–96, 180. ISBN 978-1-4165-9093-4. ^ "How On Earth Do You Follow The Beatles? Paul McCartney On Wings". Uncut.co.uk. Retrieved 18 April 2013. ^ However, McCartney played a solo version of "Let It Be", on piano, at Nottingham. Paul McCartney biography Archived 10 December 2006 at the Wayback Machine(2003). MPL Communications. Retrieved: 11 December 2006. ^ a b The seven ages of Paul McCartney, BBC News, 17 June 2006. Retrieved on 6 November 2006. ^ a b c d e f "Official Charts: Paul McCartney". The Official UK Charts Company. Retrieved 18 April 2013. ^ Garbarini, Vic (1980). The McCartney Interview [interview LP], Columbia Records. ^ Mulligan, Kate Siobhan (2010). The Beatles: A Musical Biography. Santa Barbara, Calif.: Greenwood. p. 150. ISBN 978-0-313-37686-3. 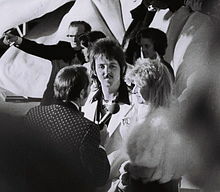 ^ "Red Rose Speedway – Paul McCartney, Wings: Awards". allmusic.com. Retrieved 17 April 2013. ^ Benitez, Vincent P. (2010). The Words and Music of Paul McCartney: The Solo Years. Santa Barbara, Calif.: Praeger. p. 43. ISBN 978-0-313-34969-0. ^ Sounes, Howard (2010). Fab: An Intimate Life of Paul McCartney. London: HarperCollins. pp. 302–03. ISBN 978-0-00-723705-0. ^ Doggett, Peter (2011). You Never Give Me Your Money: The Beatles After the Breakup. New York, NY: It Books. p. 208. ISBN 978-0-06-177418-8. ^ Madinger, Chip; Easter, Mark (2000). Eight Arms to Hold You: The Solo Beatles Compendium. Chesterfield, MO: 44.1 Productions. pp. 180–81. ISBN 0-615-11724-4. ^ Clayson, Alan (2003). Paul McCartney. London: Sanctuary. p. 167. ISBN 1-86074-486-9. ^ Rodriguez, Robert (2010). Fab Four FAQ 2.0: The Beatles' Solo Years, 1970–1980. Milwaukee, WI: Backbeat Books. p. 210. ISBN 978-1-4165-9093-4. ^ Sounes, Howard (2010). Fab: An Intimate Life of Paul McCartney. London: HarperCollins. pp. 308–10. ISBN 978-0-00-723705-0. ^ Rodriguez, Robert (2010). Fab Four FAQ 2.0: The Beatles' Solo Years, 1970–1980. Milwaukee, WI: Backbeat Books. p. 204. ISBN 978-1-4165-9093-4. ^ Madinger, Chip; Easter, Mark (2000). Eight Arms to Hold You: The Solo Beatles Compendium. Chesterfield, MO: 44.1 Productions. p. 189. ISBN 0-615-11724-4. ^ Ghosh, Palash (16 July 2013). "Band On The Run: 40 Years Ago, Paul McCartney Saved His Career With An Album Made Under Duress In Nigeria". International Business Times. Retrieved 11 January 2016. ^ a b Bailey, Jerry. "Paul and Linda Try the Gentle Life", The Tennessean, 18 July 1974. Retrieved 9 June 2007. ^ Joe English biography at Drummer Academy.com. ^ "Sounds: Wings are Flying". 22 April 1976. Retrieved 17 December 2018. 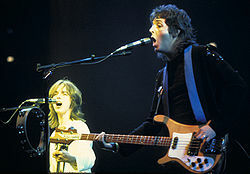 ^ "Wings Over America". paulmccartney.com. Retrieved 15 April 2013. ^ McGee, Garry (2003). Band on the Run: A History of Paul McCartney and Wings. Rowman & Littlefield. p. 106. ISBN 978-0-87833-304-2. ^ Calkin, Graham. "Paul McCartney – Maybe I'm Amazed". Jpgr.co.uk. Retrieved 17 April 2013. ^ Erlewine, Stephen Thomas. "London Town". AllMusic. Retrieved 11 March 2019. ^ a b c "The Wings Japanese Tour That Wasn't (Wings' 1980 Japan Tour) (by James Bjorkman)". paulmccartney.filminspector.com. 20 May 2013. Retrieved 3 May 2015. ^ a b c d e "Paul McCartney is arrested in Japan for marijuana possession". beatlesbible.com. Retrieved 3 May 2015. ^ "Tokyo Officials Hold Paul for Drugs". The Michigan Daily. 17 January 1980. Retrieved 11 February 2018. ^ a b Wasserman, Harry. "Paul's Pot-Bust Shocker Makes Him A Jailhouse Rocker". High Times, July 1980. Retrieved 17 March 2010. ^ Terrill, Marshall (15 October 2010). "Ex-Wings guitarist, Laurence Juber, talks about having Paul McCartney as a boss". daytrippin.com. Retrieved 23 June 2012. ^ Gambaccini, Paul "The RS Interview: Paul McCartney". Rolling Stone, 31 January 1974. Retrieved 14 May 2007. ^ "Wings Alumni to Take Flight", ClassicRockCentral.com, 10 July 2007. Retrieved 17 September 2007. ^ The Fest for Beatles Fans " Blog Archive " Denny Laine & others added to NY METRO Lineup. Archived 20 February 2010 at the Wayback Machine Retrieved 20 February 2010. ^ Bronson, Fred. "Silly Love Songs", from The Billboard Book of Number One Hits; p. 436; Billboard Books, 2003. ISBN 978-0-8230-7677-2. Retrieved on 3 June 2009. ^ Rosen, Robert. Nowhere Man: The Final Days of John Lennon. 2001, pp. 135–36. ISBN 978-0-932551-51-1. ^ a b Terrill, Marshall (15 October 2010). "Exclusive: Ex-Wings guitarist, Laurence Juber, talks about having Paul McCartney as a boss". Daytrippin' Magazine. Retrieved 13 April 2016. ^ Thompson, Dave. "Holly Days – Denny Laine : Songs, Reviews, Credits, Awards". AllMusic. Retrieved 18 April 2013. ^ Morgan-Gann, Theo. The UK's Top 10 Best Selling Singles, ukcharts.20m.com. Retrieved 12 March 2008. ^ UK All-Time Best Selling Singles, Listology. Retrieved 12 March 2008. ^ "Grammy Awards Won by Paul McCartney". Grammy.com. Retrieved 3 October 2007. ^ "List of 48th Annual Grammy Award Winners". CBS News. 9 February 2006. Archived from the original on 5 May 2007. Retrieved 3 October 2007. "Band on the Run" / "Zoo Gang"
"Venus and Mars"/"Rock Show" / "Magneto and Titanium Man"
"Maybe I'm Amazed" / "Soily"
"With a Little Luck" / "Backwards Traveller"/"Cuff Link"
"I've Had Enough" / "Deliver Your Children"
"Coming Up (Live at Glasgow)"
"Picasso's Last Words (Drink to Me)"
This page was last edited on 20 April 2019, at 03:48 (UTC).